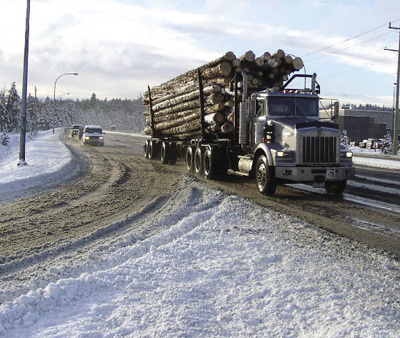 From doing your pre-trip to figuring out how to manage the weather, Logging and Sawmilling Journal presents some solid tips on how log haulers can best deal with winter weather. 1. Do your pre-trip – all of it. There are enough things that will surprise you during the day without your truck being one of them. Know your equipment - intimately. Be confident it will perform as you expect it to. Before winter is over, you are likely to need every one of those tires to give you 100 per cent traction – there’s no room for worn-out, mismatched, or under-inflated tires. And you’ll need each one of your brakes working – together. When those moments occur, there is no margin for brakes that are “too loose” or “should make it to next weekend”. 2. Get the pre-work information you need. Going on a new haul tomorrow? Talk to your supervisor and find out where you are headed, what sort of terrain it’s in, what usual and unusual hazards you should expect to encounter. Supervisor doesn’t know? Check with the dispatcher. Or find another trucker on that haul and get the skinny from him. Are you going on the same haul as yesterday? Ask yourself: What is likely to be different? New loader operator? Different rotation? New traffic coming on mainline at 37 km? Change in weather overnight? 3. Have a plan. Thinking your day all the way through - including your safe arrival back home – will help you do exactly that. Before each game, Sidney Crosby thinks carefully about this game – the opponents, the crowd, the building, his match-ups – and he builds a plan, even visualizes, what he and his team will have to do to be successful. As you enjoy breakfast, think about the day. What will be the same? What will be different? Two trips or three? Where will I meet the school bus? Commercial Vehicle Safety Enforcement will be out today, so expect a bit of a delay on Highway 97. Tom is loading first and he sets a gentle pace, so I’ll have a couple of minutes to pull over at the top of Morehead and make that call about Billy’s hockey practice. Sure, you’ll experience a few curves that require you to adjust your plan, but if you have already thought about what those curves might be, you have them at least half-solved. 4. Pay attention to the weather. Check tomorrow’s weather forecast the night before. Eight cm of new snow and -2 degrees, and warming to +3 early afternoon? This could be a stressful day. But knowing what you are likely to encounter helps manage that stress. You can reduce your stress by leaving a few minutes early, giving yourself time to drive at a casual pace, and according to road conditions. Today is not the day to worry about making your cycle time. Even if the weatherman is wrong and the roads are fine, the worst that can happen is that you are under the loader a few minutes early. 5. Pay attention to your outside thermometer. Don’t have one? Get one. Sure the traction is fine at +10 degrees (i.e. the pavement is bare), and starts getting better below -10 degrees. But when temperatures hover a few degrees either side of zero, conditions get tricky. With inversions and unpredictable winter weather patterns, temperatures change dramatically – 10 degrees over a few hundred metres. That means your traction – as well as that of the goof in the SUV with all-season tires – can change very quickly. 6. Keep an eye on the glaze. With your headlights on, scan the road ahead of you and watch for that tell-tale shine in the tracks ahead – it’s slippery out there! Can’t quite see it in your lane? Briefly glance at the road in the headlights of oncoming traffic. If it looks slick in their lane, it’s probably equally slick in your lane. 7. Set your eyes to active scan. As you drive, your environment changes, so you have to constantly refresh your view. Scan as far down the road as you can see. What do the things you see - road signs, traffic, intersections, wildlife, leaning tree, patch of ice, unusual features - tell you? What do you expect for this stretch? Re-direct your gaze to the zone half way between you and the next corner. What new information do you see that will cause you to adjust your speed, position or plan? Check the mirrors every seven or eight seconds (conditions permitting). Glance at the dashboard. Check the ditches. Repeat often, and with a few variations. 8. Have a backup plan. What’s my escape route? That little Mazda coming over yonder hill looks a little skittish – what will I do if she gets out of control? That ditch on the right looks too deep to survive, so I had better slack off and make plans for a quick stop, if necessary. Think ahead – what will I do if.....? 10. Ditch the distractions. Next time you’re “sharing an intimate moment”, ask your partner if it’s OK for you to text your boss to schedule an oil change for Friday. Let me know how that goes for you. Hauling logs is no different - both hands on the wheel, focus on the task at hand, leave the gadgets alone! Use all the tools you can to aid your ability to see your work environment. A clean windshield – inside and out. A good pair of sunglasses. Maybe even two pairs: one for bright sunny days, and another set for those low light, poor visibility conditions. Less eye strain = lower driver fatigue. Find a headlight combination that works. Lights with 10 million candle-power don’t help you in a blinding snowstorm, they simply increase the glare reflected back to your eyes. Some guys like an amber fog light to soften the glare of driving snow. Maybe point one a little toward the right hand ditch – you might not be able to see the centre-line, but you can use the snow bank or ditch line as a steady reference. Plus you can see that moose coming out of the ditch a half-second earlier. Patience and courtesy. Other folks out on the trail might not be the skilled professional you are; maybe they don’t have winter tires and didn’t scrape the windshield. Or, they’re driving too fast for conditions while trying to find the Highway Cam on their Blackberry. AND they are out on the road with you – fantastic! Practice your best driving etiquette. Give them some space. Let ‘em go ahead. Are they endangering the lives of others on the trail? Let the RCMP know. Don’t let them compromise your safe trucking zone. The above article appeared in a recent issue of Rumblings. 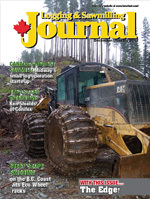 Our thanks to the BC Forest Safety Council (www.bcforestsafe.org) for permission to reprint it in Logging and Sawmilling Journal.